As a new topic, many students will have conjured up all sorts of thoughts of what Aikido is, and most of thoughts are probably correct. Aikido means different things to different people. To avoid confusion we must first look into its history. References to the original form, "AIKI JUJUTSU", date back to 1150ad. This fighting form was closely guarded by the heads of Japanese Clans in Feudal times and was only taught to the knights of the Clan. The close combat weapons used in those days were, swords, spears, staffs knives to name a few. In general fighting was carried out in close quarters. Today, as we have seen in recent times, battle is fought at distant and with explosive weapons such as guns & bombs etc. To use a Martial Art against such devices would be pointless. So the reasons for learning a Martial Art today are entirely different from the original reasons. Today it is more about leisure and in essence the spirit of what once was. From this we can practise and become skilful with a more useful purpose. This purpose is the development of body and mind for the good of all. Aikido is a Martial Art that has a history that reaches back to 11th Century Japan. It is system of training that is attributed to a Samurai General by the name of Shinra Saburo Yoshimitsu. Having studied many forms of Ju-Jitsu, the general devised a system of self-defence without weapon, that would provide his officers with both physical fitness and spiritual well being. This system, which he named Daitoryu-Aiki-Ju-Jutsu, proved so successful and valuable that for centuries afterwards it was kept secret and handed down only through members of the powerful Minamoto family. Later it was handed down to the Takeda family of the Aizu clan. Dr. Sogaku Takeda taught the hereditary successor, Professor Morihei Uyeshiba in 1910 when the professor was 28 years of age. He too possessed a wide knowledge of the Japanese martial arts and was expert in many schools of Ju-Jutsu. His first master in the martial arts was one Tokuzaburo Tozawa who taught him the forms of the Kito-Ryu school when he was in his teens. At the age of 20 he studied Yagi-Ryu and early form of fencing from Masakatsu Nakai. It was Nakai Sensei who taught Uyeshiba to use the Bokken (Wooden Sword) really well. He also studied Judo with Kiyoichi Takaki in Wakayama Ken. From all these he took the best of the techniques he had learned and added to them his mastery of Daitoryu-Aiki-Ju-Jutsu and so formed his own system, which is now known as Aikido. One famous samurai who has had a deep and lasting influence on the formation of Kikusui Kai was Masashige Kusunoki. He was a powerful symbol of loyalty to the Emperor Go-Daigo. His heroic defence of Chihaya Castle became one of the most famous examples of bushido. The Kikusui no Mon (the Kikusui Kai emblem or badge) comes from his family crest, which consists of kiku – chrysanthemum and sui – water. 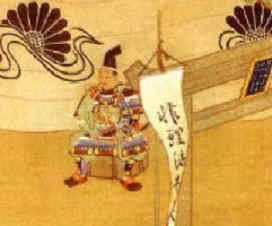 A translation of old characters which form part of the battle flag of Masashige Kusunoki. This is a explanation of the world order, which reads, “Atrocity cannot win over Justice. Justice cannot win over Law. Law cannot win over Authority. Authority cannot win over God.” This teaching dates back to 13th century Japan and may be difficult to relate to modern times. Written below the Kikusui no Mon are old style characters which form part of the battle flag of Masashige Kusunoki. WHICH PREVAILS OVER INJUSTICE AND INIQUITY"
Today the "Battle Crest" is worn in a much simpler form and signifies a belonging to and perpetuation of the great loyalty that was demonstrated by Masashige Kusunoki. A modern explanation might be that the Chrysanthemum shows true natural beauty and the bottom half is the road leading to this excellence. The blue circle around the outside represents a circle of friends.